Hey hey! I've been delaying this post for as long as I can...but now it's time to just face it and write. Why do I keep pushing this off? Well, that's a good question. One thing that I'm always lazy at doing is cleaning my make-up brushes... which should NOT be my attitude towards that. Cleaning your make-up brushes is one of the most important and hygienic steps to take in order to maintain clean skin without applying old product, oil, germs, and dust back onto your face. It's about time that I clean my brushes as well so here's a post to show how I deep clean my brushes. I don't apply much makeup on a daily basis but I still like to primp myself up once in a while. If you're someone like me, then I suggest deep cleaning your brushes after 2-3 times of use. People who apply makeup on a more regular basis would spot clean their brushes with a brush cleanser in between deep cleaning sessions but I skip that since I don't use them as often. Not much is required for this process, all you need is baby shampoo and a small towel! 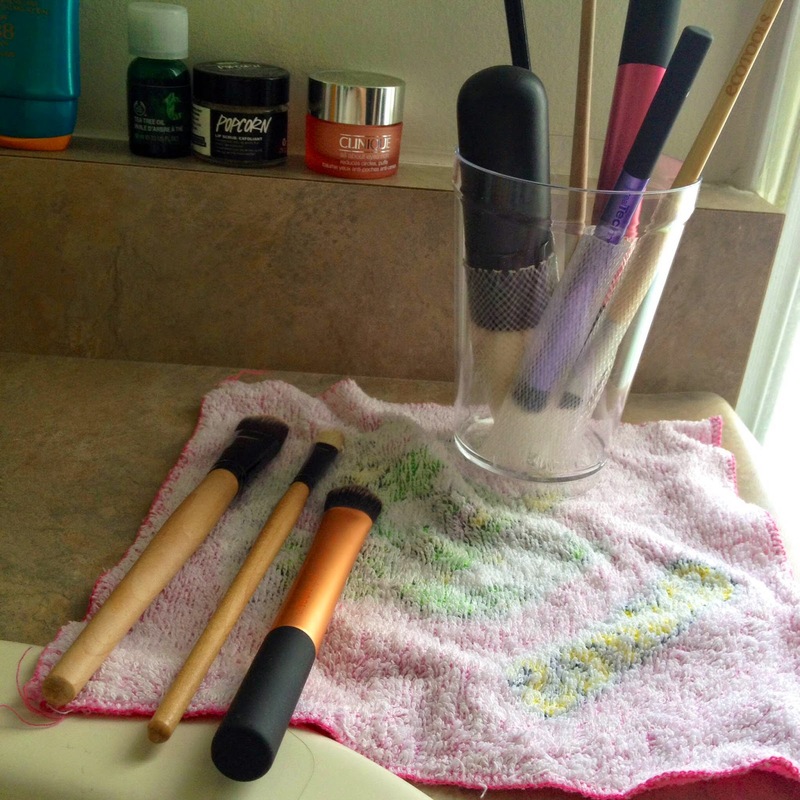 If you're using brush guards as well then you'll need a cup to store the brushes upright (if you don't know what they are you can read about them in my June Haul post). 1. Lay out the towel by the side of your sink. You'll be placing your washed brushes on it to dry (If you have brush guards, have them ready and a cup in which to place those brushes). 2. Squirt some baby shampoo into the palm of your hand. Squirt a quarter-sized amount for a larger brush or nickel-sized for smaller brushes. Add a little bit of water with the shampoo. 3. 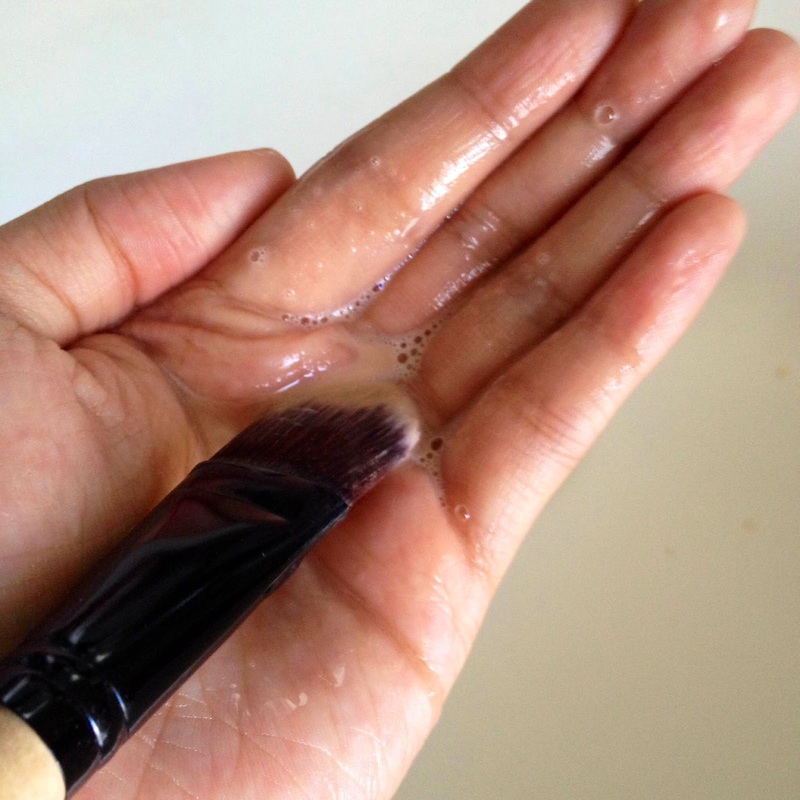 Take a dirty brush and begin swirling it into the shampoo and water in your hand (If the brush is very big and dense, run the brush under some water first before swirling into the shampoo). The shampoo should lather up nicely and you'll begin to see the product coming off the brush. Keep swirling until it looks like all the product has come off your brush. You can always add a bit more shampoo/water if it's not enough to get all the product off. 4. Turn on a small stream of water from the tap and rinse the lather off the brush. Make sure you're not holding the brush upwards such that water can flow into the barrel of the brush. You don't want that to happen as it can loosen the glue holding the handle and bristles together. 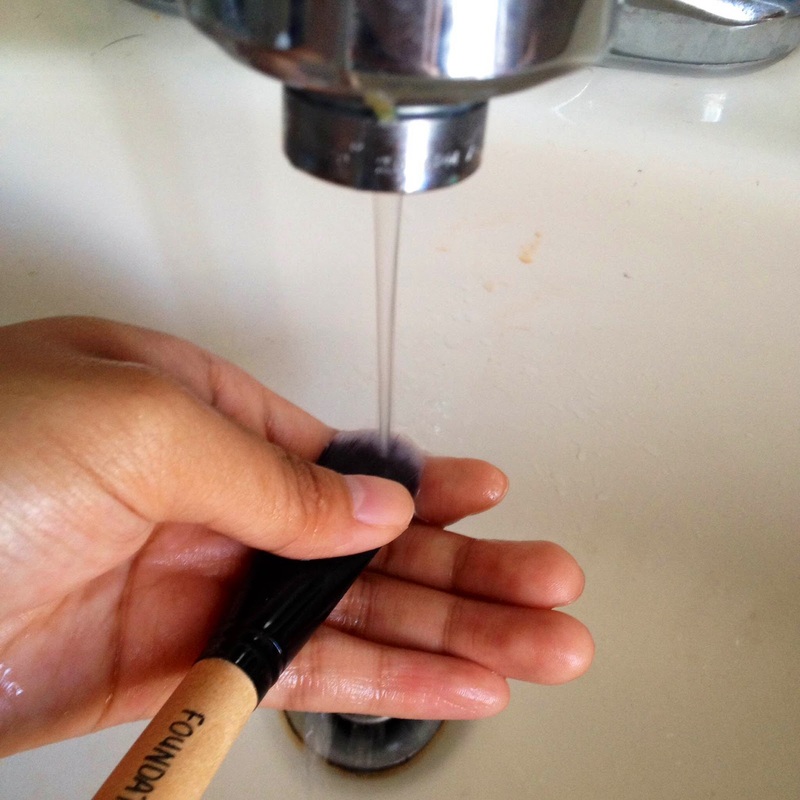 Once done, try and get as much water out of the brush by squeezing the water out from between your fingers. 5. Lay the washed brush on the towel to dry. If using brush guards, place the appropriate-sized guard onto the brush, then place the brush in the cup upside down so that the water can drain out of the brush. Make sure that the hairs of the brush are completely enclosed by the guard. The guard should be propping up the brush, not the bristles. ...and there you go! 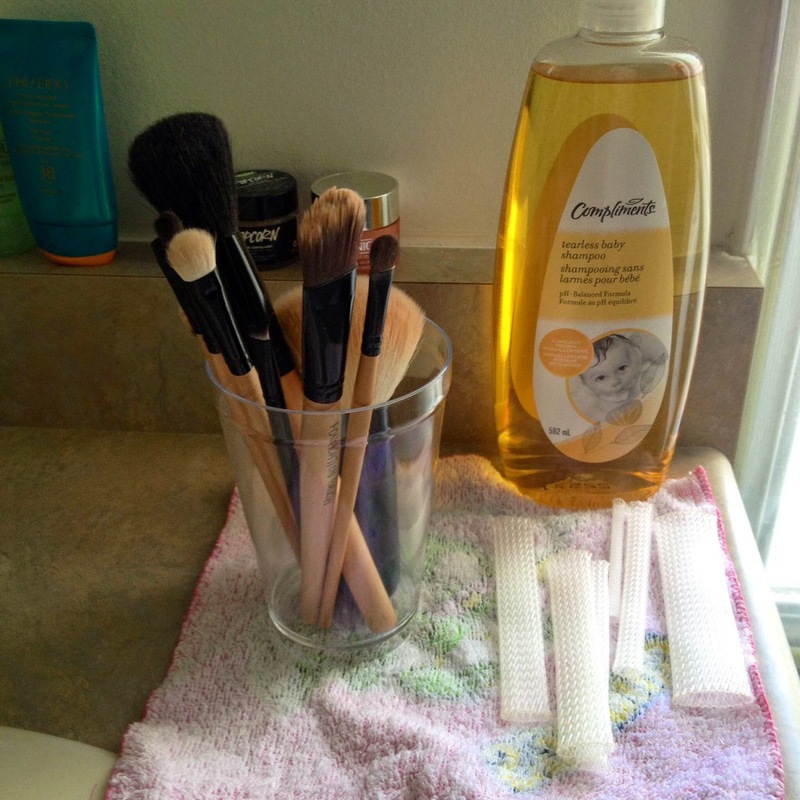 Clean brushes to use. :) Hope you found this useful!